Balance, they say, is the key to getting it right in the film industry. That's perhaps why, a little after a classy outing in Vaaranam Aayiram that appealed to urban audiences, actor Suriya decided to do a rural cop act in Singam which went on to become a huge hit. "I pitch my films according to the content," says Suriya, "In this case, I made it clear that Singam was a mass film, at the very outset." Suriya : I'm currently excited about 7 am Arivu, my film with Murugadoss. It's a different film and has shaped up quite well. Karthi : Working on my Pongal release, Siruthai, was a superb experience. I really enjoyed it as it was a pucca commercial film. Even during the promotions of the film, I pitched it that way. Suriya : Oh, there's so much we discuss over dinner. There's loads of gossip. Whenever we are all in town, we ensure that it's a round-table setup and everyone of us looks forward to it. They still tease me with Jo during dinner time! Karthi : I tell a lot of stories to Diya (Suriya-Jyothika's daughter) about our growing up years in Coimbatore, of which we have fond memories. In fact, we want to take her to our native town and show her around. 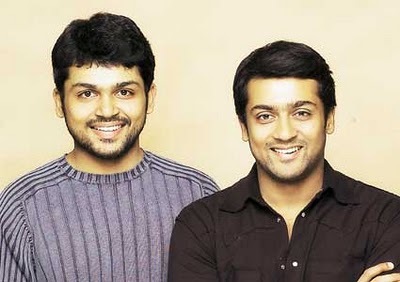 Suriya : With Karthi, I always voice my opinion if he comes to me for advice and listen to his version of the story too. Sometimes, we go to appa and get a whole new perspective on the issue we're discussing. The other day, I met some people at the gym and the entire conversation revolved around Karthi. They were all enquiring about him and discussing in detail with me the movies he'd done. They said, 'You've both taken different routes and are doing very well'. I felt happy hearing that. Karthi : When I wanted to get into films, Suriya quietly told me two words which I still cherish — 'Change yourself'. He told me that if I wanted to become an actor, I'd have to change my look and personality. Suriya : Though Karthi's debut Paruthiveeran blew me away, my favourite flick of his is Naan Mahaan Alla because his act in it was very natural. Karthi : I loved Suriya's performance in Vaaranam Aayiram; his expressions in the movie, especially the train sequences, were really fresh. 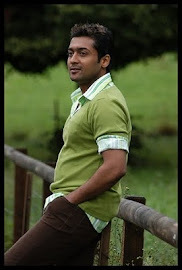 Suriya : Do your best and keep learning — that's what I believe in. Karthi : Never feel pressured. We're both lucky that since our childhood, we've never been pushed into doing anything.